Roundworms, tapeworms and bots can infect your horse causing several problems including weight loss, failure to thrive, mild to severe colic and diarrhoea. Adult worms in the intestine release tiny eggs that contaminate the pasture. The eggs hatch and release immature worms that are eaten by other horses and the cycle starts again. Foals and young horses are most susceptible to worms; older horses can also show signs of disease if heavily infected. ‘Poo picking’ is a very useful way to keep worm population on the pasture to a minimum. This involves regular picking up of all droppings so that worm eggs are removed from the pasture. Rotating the grazing with cattle/sheep is also useful, they will clean the pasture by eating horse worms. Horse worms do not cause disease in cattle/sheep and vice versa. 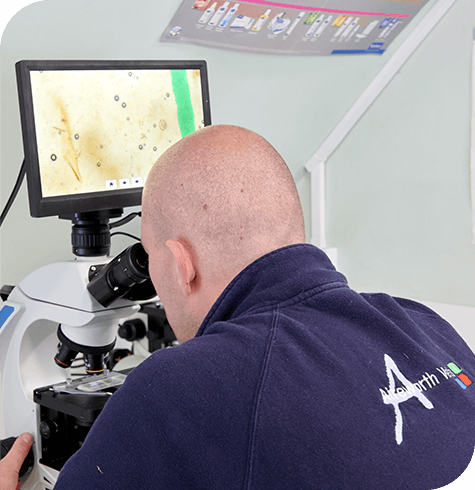 The test which is done in our laboratory involves counting the number of roundworm eggs in a sample of fresh faeces. Our nurses will report whether the results are a low, moderate or high count; they will then advise on whether your horse needs worming and what product is appropriate. A worm egg count only tells us about adult worms, it does not include young red worms. The presence of tapeworms requires a saliva test, the testing kit can be purchased from the practice.